Commentary # 2: Multiple Intelligences, Hypertext and Hypermedia: Are They Connected? The continuation of the remediation of print in human history as explored by David Bolter (2001) implies that humans are always engaged in the process of configuring ways to improve the transmission of information and ideas. Bolter suggests a tension between visual and print modes that is also continuing in education, despite the unregulated and unstructured journey from medieval iconography to print, then to photographic and electronic visual presentation. “It is interesting to speculate how photography, film, television and multimedia might have been developed and used, if Western cultures could somehow have jumped over the technology of printing and gone directly from iconography to photographic and electronic visual presentation” (Bolter, p.55). According to Bolter, visual technologies had to struggle to highlight themselves within a culture of prose and the earlier verbal rhetoric. (p. 55). Could it be that this recursive pattern somehow connected to the way in which Howard Gardner (1993) represents human intelligence? Could it be the source of this disorganized development of writing technologies? Gardner’s theory emerged from cognitive research and suggests that there are seven multiple intelligences which can be used to describe the way humans perceive and interact with the world as intelligent beings, which are the: linguistic, logical mathematical, musical, bodily-kinesthetic, spatial-visual, interpersonal and intrapersonal ( (Mckenzie, 2005). Despite documenting these seven, Gardner suggests that there are others which he attempts to describe in his later work but these seven have been useful to educators. They help to determine individual differences and have allowed many teachers to target their learners effectively. Could it be that the shifting which has been taking place throughout the ages, which Bolter articulates as “a process of cultural competition between or among technologies” (p.23), be as a result of the various different individuals possessing varied multiple intelligences? Bolter suggests that the shift which occurs as remediation usually takes place when new technology replaces an older one by “borrowing and reorganizing the characteristics of writing in the older medium and reforming its cultural space” (p. 23). The writing done on papyrus remediated oral communication by allowing for the eyes and ears to be involved and so giving the words “a different claim to reality” ( p.23). The persons involved in effecting this remediation all possess a very constant variable, their humanity. With an application of Gardner’s theory there is a very likely possibility, in addition to the human desire to improve on existing technologies, that many of the inventors and innovators throughout history possessed varied learning styles which propelled them to add and subtract in order to arrive at technologies which seem to address all seven multiple intelligences. Hypertext is one such technology. In this century, “hypertext”, according to Bolter, is not without hypermedia which offers so much more to the reader than the printed word. Bolter sees it as offering a “second challenge to the printed book” (p.47). The current old fashioned print which may seem like simple and natural communication, at this cultural moment, especially to those who are perhaps not digitally literate, in comparison to the electronic hypertext might not seem so in the years to come. It might actually more natural for some information to be represented as hypertext (Bolter, p. 46). An examination of hypertext reveals that all the multiple intelligences are represented in the way the technologies are combined. I say combined whilst Bolter proclaims ‘remediation.’ For linguistic learners which learn through words and language there is text to be read and to be responded to by the user. There are logic and numbers to be manipulated by the logical-mathematical learner. Sound, music and rhythm are available and easily accessed for those who are musically oriented. Images and spaces are varied for spatial learners. According to Sherry Turkle (2004) “[f]or some people cyberspace is a place to act out unresolved conflicts, to pay and replay characterological difficulties on a new and exotic stage” (p. 23). Virtual communities offer opportunities for adolescents and young adults to interact anonymously with different identities in an attempt to concretize their own sense of self. Both the interpersonal and the intrapersonal intelligences are catered for as individuals interact with each other using the above media. Finally, the bodily-kinesthetic is addressed in two ways. The tools and equipment are handled in the process of using them and there are visual media which portray motion that the user can get involved in. An example of hypertext combined with hypermedia which is can be recognized as the World Wide Web. Whilst Bolter cites several educational theorists who have examined the effectiveness of hypertext and hypermedia as new dialogic forms, he also recognizes that the academic community is showing reluctance to participate in some of the refashioning that writing technologies have undergone. The World Wide Web that I find very useful is sometimes rejected as not having material of high calibre. Bolter also points out that popular culture which includes “the business and entertainment world and most users have shown little interest in a serious critique of digital media, but they are all eager to use digital technology to extend and remake forms of representation and communication” (p.118). If the hypertext and hypermedia have remediated print to the extent that they are capable of addressing all the various multiple intelligences, then educators need to embrace them as they did the multiple intelligences, then the quality of instruction will improve and learning will be maximized. The experience that educators had while learning the original classic works will change, and continue to undergo change, so rather than resist the change educators will have to join in and become digitally literate. A book though not able to address all human needs will still be easier to carry and handle than an electronic one will. This does not change the idea that educators need to listen to the inner voice of the students like these. Bolter, D. J. (2001). Writing Space Computers, Hypertext, and the Remediation of Print. New Jersey: Lawrence Erlbalm Associates. Gardner, H. (1993). Frames of the Mind: The Theory of Multiple of Intelligences. New York : Basic Books. Mckenzie, W. (2005). Multiple Intelligences and Instructional Technology. Washington: iste Publications. Turkle, S. (2004). Whither Psychoanalysis in Computer Culture. Psychoanalytic Psychology , 16-30. Literacy has been discussed and will continue to be a topic of discussion far into the human future. The need to learn and to facilitate learning and the economic drivers that push technology changes will impact learning and how we view and define literacy. Ong states that “Literacy began with writing but, at a later stage of course, also involves print”. (1982, pg. 2) One would assume that literacy would and should develop to become multifaceted to include all information and communication techniques and the social factors that influence those modes. As the identified by the Oxford Canadian Dictionary, literacy should imply an understanding, along with the ability to read and write. In the article A Pedagogy of Multiliteracies: Designing Social Futures, The New London Group presents the concept of multiliteracies – a redesigned ‘literacy’ with mutual consideration for “the multiplicity of communications channels and media, and the increasing saliency of cultural and linguistic diversity.” (1996, pg. 4) The new globalization, with ever increasing diversity, has resulted in an encroaching on the workplace, in public spaces and in our personal lives. These influences are driving a demand for a language “needed to make meaning” (1996, pg. 5) of our economic and cultural exchanges. How we perceive and how others perceive us is a factor in success. This success impacts and affects all facts of our lives. But in a global village, can we ensure that success is attained by all. It would appear to me that the requirement for multiliteracy is needed mostly in areas of economic disadvantage and disparity. Where access to even “mere literacy” (New London Group, pg. 4) is limited. While the New London Group article was written in 1996, it was bold to address some of the utopian ideals within education and literacy; individualized education at both a local and global level, with no standards and a high regard for cultural and linguistic differences in the classroom. Sadly, literacy is influenced by the very diversity and globalization that is forcing most of our social changes. These changes can be best described using the very words of described by the authors; “Fast Capitalism” (pg. 10); “rigorously exclusive” (pg.6); and “market driven” (pg.6). As Dobson and Willinsky states “a gender gap still persists in many parts of the world, being wider in some countries”. (2009, pg. 12) This gap may be an indicator “that in certain respects there has been very little movement in the gender gap in the last two decades”. (pg. 13) Perhaps with such disparities in our global context, the goal of our educational organizations and facilitators should be to ensure that a standard is met with regards to information literacy- “ the ability to locate, evaluate, and use effectively the needed information” (Dobson & Willinsky, 2009, pg. 18) This would ensure that a “competence is some field of knowledge, technology, etc.” (Oxford Canadian Dictionary) is achieved. New London Group. (1996). A Pedagogy of Multiliteracies. Designing Social Futures. Harvard Educational Review, 66(1), 60-92. Oxford Canadian Dictionary. (1998). Oxford, New York: Oxford University Press. The changing form of representation in modern media, and the changing relationship between reader and author in hypertext both call for a change in the method by which literacy is taught. The way that hypertext, or better still hypermedia, is experienced and produced requires a different set of skills than those taught in the traditional classroom. The fact that some of the changes called for by the New London Group closely mirror practices suggested in constructivist learning theory gives added weight to the impetus for a shift in classroom methodology. In constructivism, learning is student centered, and meaning is personal, being constructed actively by the student within a social context. These teaching techniques are precisely what are required to produce students literate in hypermedia. Hypermedia incorporates multi-modes of meaning involving design decisions in, at the very least, the linguistic, audio, spatial and visual realms. Education has traditionally focused on the linguistic logical intelligence, but multi-literacy requires designers and viewers to develop multiple intelligences (as defined by Gardner) and multiple grammars for different modes of representation. Though parallel means of representation do exist between grammars (Cope and Kalantzis, 2006 citing Kress, 2000b and Kress and van Leeuwen, 1996), on the whole, different modes of representation present meaning differently. For example, speech, and consequently writing, organizes events temporally, whilst images represent spatially arranged entities (Kress, 2005, p.13). Therefore, language literacy requires a different grammar to visual literacy. Individual students naturally vary in their mastery of these grammars; one may have an instinctive understanding of spatial representation, while another is more aware of linguistic meaning. Traditionally, literacy has been taught mono grammatically, whereas constructivism embraces the idea of individual perspectives in a classroom that work collectively to create meaning. The Pedagogy of Multiliteracies (The New London Group, 1996) calls for the active construction of meaning and teaches learners how to be “active designers of meaning” (Cope and Kalantzis, 2006, p10). In the traditional classroom, learners are encouraged to repeat modes of representation in the production or consumption of media rather than construct new, personalized designs influenced by their own perspective, a perspective influenced by cultural mediation based on Vygotsky’s Cultural Historical Activity Theory. In the “Multiliterate” classroom, students become constructors of meaning and are transformed in the process. “Meaning makers remake themselves” (The New London Group, 1996, p15). The Pedagogy of Multiliteracies is a student centered, active process that furthers a Constructivist agenda. In the traditional text, as in the traditional classroom, the author offered a single vision or mode of representation to which the student adapted herself and “followed the strict order established by the writer while needing to interpret the word signifiers, turning them into his or her signs” (Kress, 2005, p.9). In hypermedia, it is the visitor, not the author, who determines the path (Kress, 2005) and students are “agents” (Cope and Kalantzis, 2006, p. 7) of their own knowledge path. Rather than being passive, hypermedia readers are “meaning makers (that) don’t simply use what they have been given; they are fully makers and remakers of signs and transformers of meaning” (Cope and Kalantzis, 2006, p.10). The fluid nature of meaning suggests a constructivist epistemology and a shift from the author or teacher as authority. The New London Group does not see meaning as a concept external to the learner, but rather as internal. Traditional teachers, just like authors, were authorities, establishing a path through their text, which the reader or student followed diligently. Digital authors and teachers are no longer mappers of knowledge; they are not sources of knowledge, just sources of information. If the students of today are to be “actors rather than audiences” (Cope and Kalantzis, 2006, p. 8), a student-centered focus for education is called for. 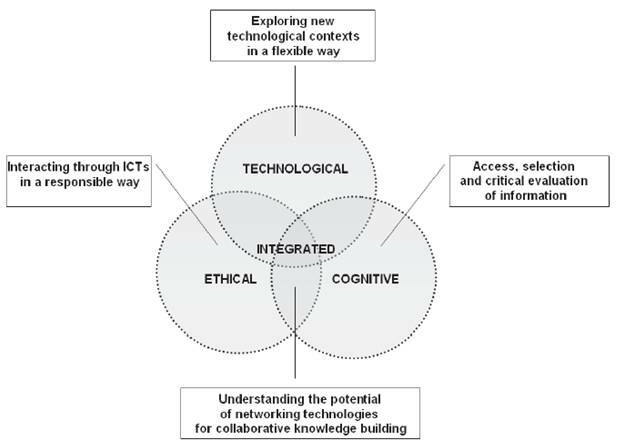 Finally, digital literacy requires a “more holistic approach to pedagogy” (Cope and Kalantzis, 2006, p.3). The interconnected modes of representation suggest a classroom where the focus is on ways of knowing rather than the division of knowledge into isolated areas. Modern literacy requires a knowledge of multiple grammars, those of linguistic, visual, audio, gestural, and spatial and representation (The New London Group, 1996, p. 17). Moreover, an understanding of how these modes combine synaesthetically is a separate grammar all together. This last form, the multimodal representation of meaning, is special in that it represents the way the other modes play off each other to create interconnected patterns of meaning (The New London Group, 1996, p. 17). This multimodal grammar is important for digital literacy as children are naturally synaesthetic, in the way they combine their modes of representation, and “much of our everyday representational experience is intrinsically multimodal” (Cope and Kalantzis, 2006, p. 13). If literacy is to be relevant to learners, then pedagogical activities must be authentic and related to students’ experience in a world of multimodal communication. Hence it is counterproductive and unnatural to compartmentalize modes of meaning as traditional pedagogy has done. Cope, B., & Kalantzis, M. (2006). ‘Multiliteracies’: New Literacies, New Learning. Pedagogies: An International Journal, 4(3), 164-195. The New London Group. (1996). A Pedagogy of Multiliteracies. Designing Social Futures. Harvard Educational Review, 66(1), 60-92. For the RipMixFeed activity I collected a set of resources using the social bookmarking tool del.icio.us. Many of us have already used this application in other courses to create a class repository of resources or to keep track of links relevant to our research projects. What I like about this tool is that the user can collect all of their favourite links, annotate them and then easily search them according to the tagged words that they created. This truly goes beyond the limitations of web browser links. Use the tags ‘Module4’ and ‘ETEC540’ to find the selected links or just search using ETEC540 to find all on my links related to this course. Essentially this is a self-directed learning module on Roland Barthes ideas on semiotics. The section on Readerly and Writerly Texts is particularly relevant to our discussions on printed and electronic texts. Rheingold states that a lot people are not aware of what digital literacy is. He briefly discusses five different literacies needed today. Many of these skills are not taught in schools so he poses the question how do we teach these skills? University of Maryland University College faculty, David Taylor created a five part video series on digital literacy. For convenience sake here is one Part II where he discusses the shift to the ‘new literacy’. Toward the end of the video, Taylor (2008) makes an interesting statement that “today’s literacy means being capable of producing fewer words, not more”. This made me think of Bolter’s (2001) notion of the “breakout of the visual” and the shift from textual to visual ways of knowing. Alexander (2006) suggests that social bookmarking can work to support “collaborative information discovery” (p. 36). I have no people in my Network as of yet. I think it would be valuable to connect with some of my MET colleagues so if you would like share del.icio.us links let’s connect! My username is nattyg. Alexander, B. (2006). 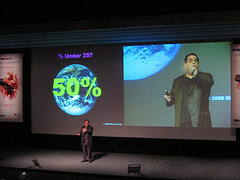 Web 2.0: A new wave for teaching and learning? Educause Review, Mar/Apr, 33-44. Bolter, J.D. (2001). Writing space: Computers, hypertext and the remediation of print. London: Lawrence Erlbaum Associates, Publishers.